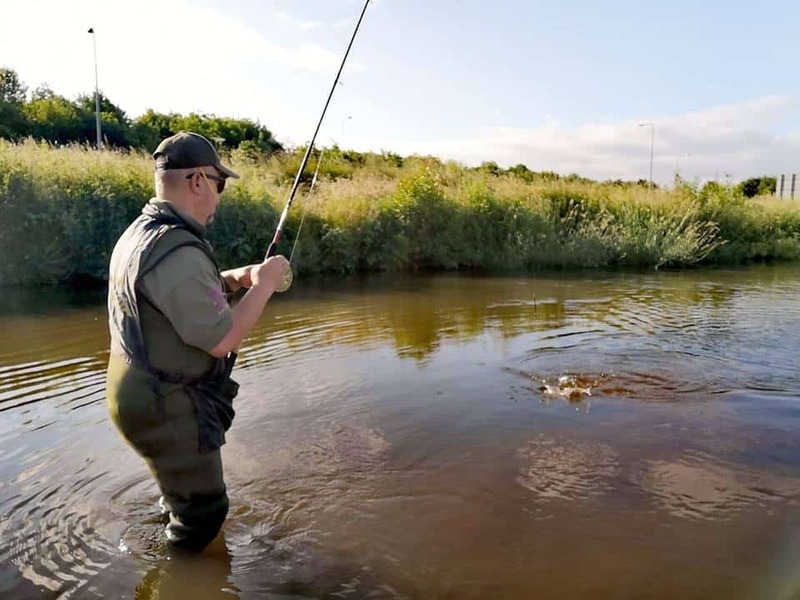 My first session this week saw me don the waders (and hope the mice hadn’t put a hole in them) and slide carefully into the River Churnet in hope of dace and grayling. It’s important to point out that entering any watercourse should be done with utmost care, and I was careful to use a wading staff (landing net pole) to carefully check the riverbed before moving. Although I know the river well, I’m also aware that floods may have changed the contours of the riverbed, and that submerged obstacles may not have been there before; always check, never think “it won’t happen to me” because every year, unsuspecting anglers are drowned… No-one ever wakes up in the morning and thinks that it will happen to them, just like no-one expects a house fire or car accident either, but someone has them; be careful, it’s your life at stake! As it turned out, low water levels put the water barely above my knees, and I was able to select a fairly light float to trot down the steady glide in front of me. Luckily, I’d recently happened upon some old Ivan Marks stick floats at a local car boot sale, battered and chipped, but still classics, and I couldn’t wait to watch one dance downstream. Attached ‘top and bottom’ with float rubbers, I put the bulk of my split shot half way down the line and added a No.6 a few inches from the hook, just to keep the maggots down in the flow. 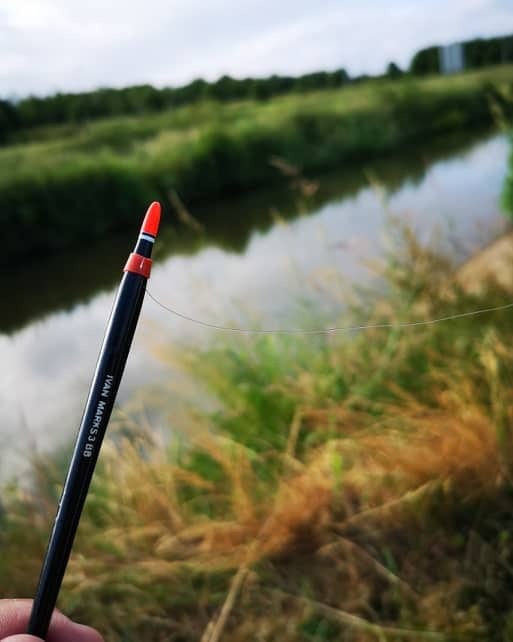 By shotting like this, the float semi-cocked instantly, so I didn’t miss any quick bites, and then settled nicely, but still allowed me to check the float to let the bait rise up over any streamer weed beds of which there were plenty! 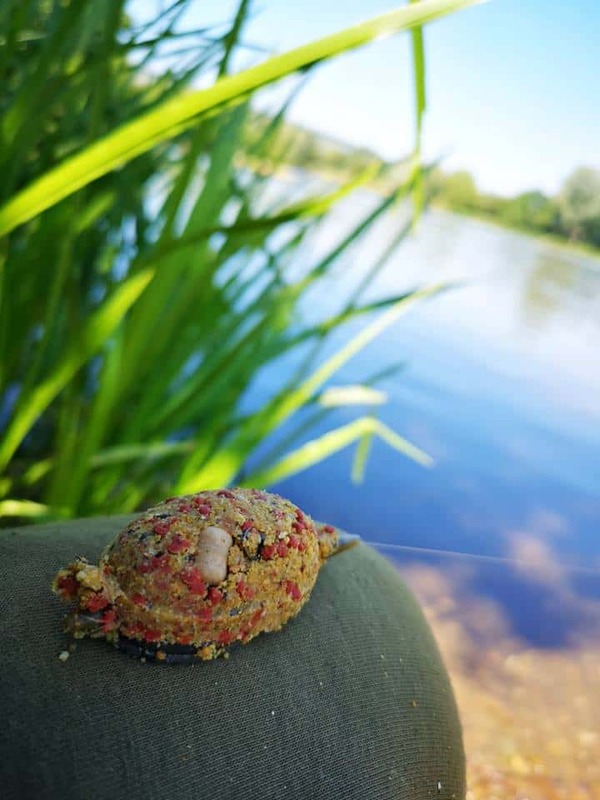 The sun shone warmly as I flicked a few maggots ahead of me, then lowered the float in behind to move through the swirling cloud of bait, and I couldn’t have been happier; it was indeed a blissful way to get back onto moving water! The red tip of the float moved away from me, carefully controlled by gently thumbing the centrepin to keep pace, and then disappeared! A bite on the first trot through! 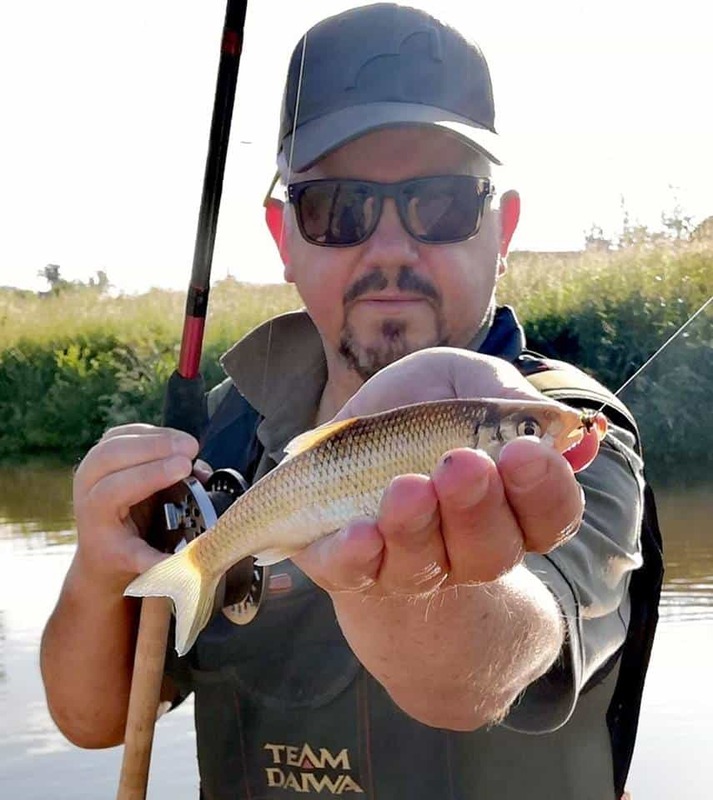 A deft flick of the wrist resulted in a series of rapid thumps at the other end of the line, and a plump dace was bought to hand… perfect! 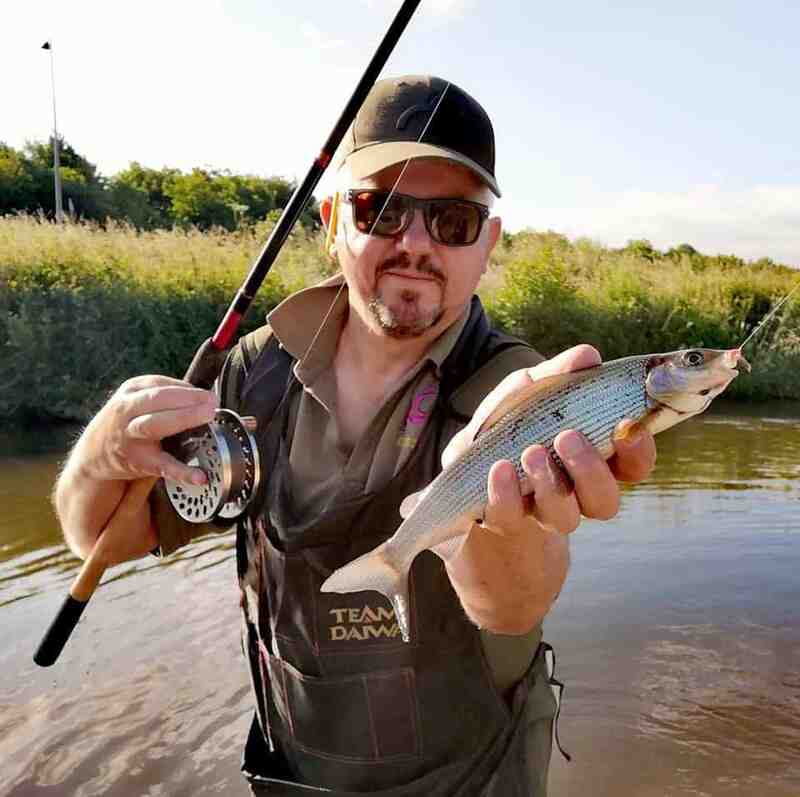 As I unhooked the silver shimmer, and held it in the flow to recover, a pinch of maggots was sent twirling downstream to keep fish interested, and I dropped the float in once more. Once again, at exactly the same place, it shot out of sight, but this time, the culprit has a beautiful lilac grayling, and the sunlight revealed a myriad of pale hues as it shone through an angrily lifted dorsal fin as it sought to escape… to no avail; it came to hand and was held upstream to get its energy back before swimming away. Throughout the next hour, I plundered a steady stream of beautiful silvery fish as I enjoyed the sunshine. I caught nothing over a pound in weight, but I don’t think I’ve had a more enjoyable hour so far this year! As the sun rose higher though, the bites petered out, so I clambered from the river, and moved to the lake next door to try out some new goodies! I stuck it out. I’m convinced by the quality of the bait, and after a couple of hours, I’d amassed ten carp, all doubles, whilst others had struggled. Did the new Sweetmeat make the difference? I’d like to think so, as I know many anglers know much more about the lake than I, but they had found fish hard to come by. 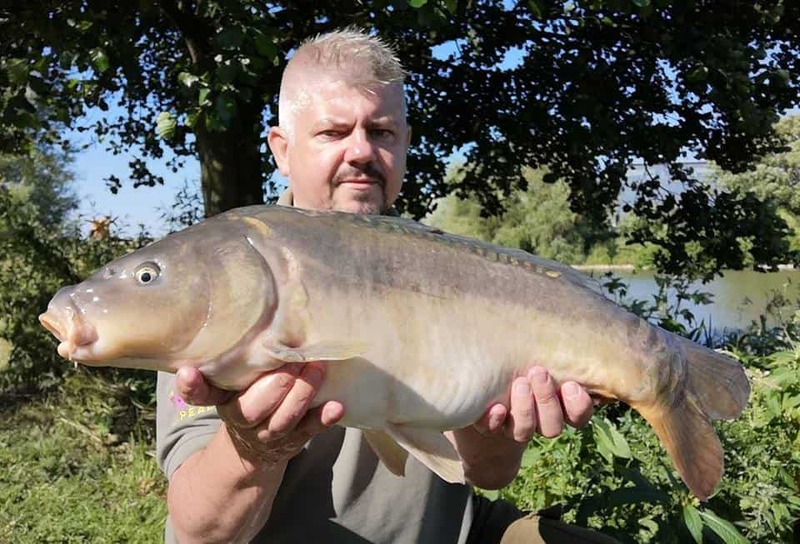 Recent matches had been won with less than I’d caught, whilst I was pleased to catch steadily and enjoy good sport in fantastic sunshine. I’m pleased with the new products, they are easy to mix properly, smell great and stick to the feeder well, so should be simple to use by all. I’m yet to try the new Classic Corn mix, but as I’ve found a new tench venue, it will be getting put to good use on there, and it will be a proper test too as the water is packed with weed and has probably never seen Spotted Fin baits either! Wish me luck!